1. How does fluorescent leak detection dye work? Add or inject the fluorescent dye into the system and let it circulate with host fluid. 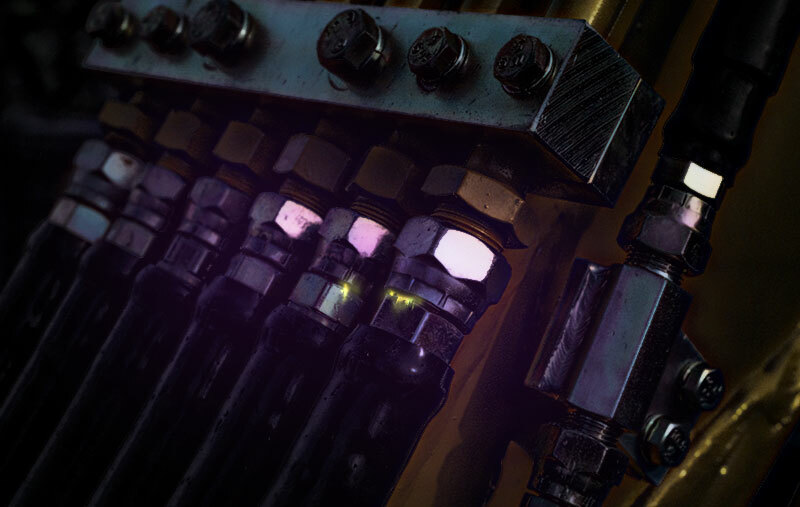 Once circulation is complete depending on size of system use one of our high quality UV lamps to inspect for leak sites. 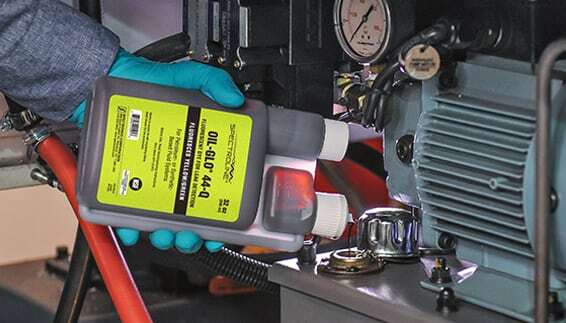 2) What is the difference between Spectroline leak detection dyes and other leak detection dyes? Well first we are the inventors of fluorescent leak detection dyes, our patent. We are OEM approved and have the highest quality dye to make sure your system is in good hands. No co-solvents are added to our dyes which can cause major system issues. 3. What does the fluorescent dye do once it is in my system? The fluorescent dyes will work together with whatever host fluid it is being used for, we provide a sample analysis with our in house laboratory. 4. How much can leak detection save me? There are many factors that determine how much you can save, also it can serve as a preventative maintenance protocol. 5. 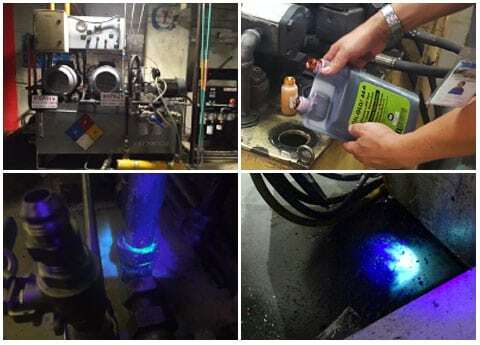 How long does fluorescent leak detection dye take to find leaks? Depending on the size of your system it can take anywhere from 5-45 mins. 6. What do you mean by “eco-friendliness” of the fluorescent dyes? We care about your health as well as the health of our planet. The materials used in the dyes consist of completely organic-free fibers. It makes our leak detection dyes different from conventional dyes that have co-solvents. Due to its materials, after half a year in the ground our dyes will fully degrade without any harm to nature. The second important thing is that we do not use any chemically aggressive liquids, which can damage one’s health. And finally, UV lamps consumes only 10W, which equals to the power of a simple light bulb. In this day and age, energy saving not only has economic benefits, but also enables us to reduce consumption of natural resources as well as emission of harmful substances into the atmosphere. 7. Can fluorescent leak detection dyes be seen without a UV lamp? While using Spectroline dyes it is suggested to use a UV lamp in a dark environment to see the smallest fluorescent dye glow. 8. Does the fluorescent dyes need extra maintenance? 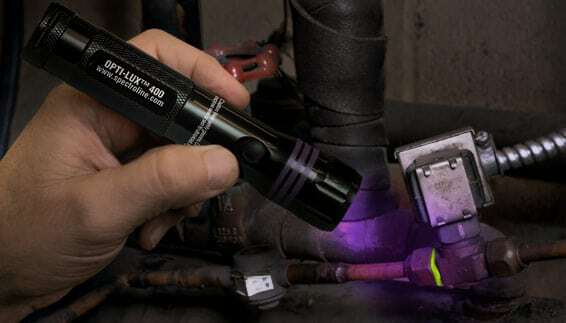 Fluorescent leak detection is very easy to use and ready to be used right out of the box. In case of any questions you can contact our support service or your local distributor (if you bought the lamp not on our website). If your UV lamp requires to be repaired you need ship the unit to us or to your local distributor if any available. In case the defect is covered by warranty your shipping costs will be refunded. 9. Where can I find more detailed information about the full product line? Our fluorescent and UV products can be found here.